Do you want to join a team of explorers resolved to extend the frontiers of science and our understanding of the world we live in? Do you want to help pursue clean, renewable energy technologies, new supercomputer architectures, novel computational methods, and breakthrough science? If breakthrough science and engineering unlock the adventurer inside you, consider exploring the position of deputy division director at the Argonne Leadership Computing Facility (ALCF). You will join a team that thrives on pursuing answers to the world's most challenging computational science problems. We're seeking a scientist who offers superb management skills and the ability to direct complex technical organizations. We need a high-energy individual who thrives on challenging problems and possesses in-depth knowledge of and expertise in high-performance computing, quickly launches and delivers multiple projects, and easily grasps issues in a wide spectrum of sciences. Our candidate also must communicate fluently with diverse audiences. A master’s degree or doctorate degree and at least five years' experience in managing scientific computing facilities or major scientific projects are required. 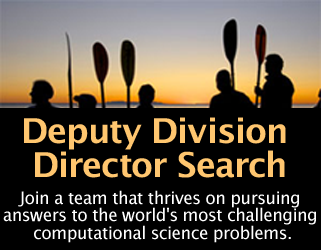 As deputy division director, you will help the ALCF director with new computational science initiatives, provide input to strategic plans for the division and exascale computing, and assist in the design and deployment of new systems. A gateway for scientific discovery, the ALCF partners with the world’s best computational scientists from diverse disciplines, ranging from molecular biology and nanomaterials to climate modeling and astrophysics. Using our supercomputers, scientists are gaining insights into dark energy, "green" low-emission aircraft propulsion, drug discovery, and the impact of global warming. We also work with industry partners and collaborators to design extreme-scale supercomputers. Our current machine, Intrepid, debuted in 2008 as the world’s fastest computer for open science. This IBM Blue Gene/P has a peak speed of more than 557 teraflops. Argonne is a U.S. Department of Energy laboratory managed by UChicago Argonne, LLC. Argonne is an equal opportunity employer, and we value diversity in our workforce. The lab is situated in the western suburbs of Chicago, near Naperville. In 2008 Money magazine ranked Naperville among the top 5 small cities to live in the U.S. Argonne is 30 minutes from Chicago, and many employees live in the city. The Great Lakes and surrounding forests provide ample opportunity for adventures that don’t require a megawatt of electrical power. If you have any questions about the position, contact careers@alcf.anl.gov. If you’re interested in joining the team, please post your curriculum vitae to the Argonne careers website applying to requisition 314620. We're seeking a scientist who offers superb management skills and the ability to direct complex technical organizations.